and 6 miles north of Hershey, PA.
2019 Husqvarna models in stock, a small $100 deposit will guaranty you a new Husqvarna. 2018 Vitpilen 401 (1 Sold, 1 in Stock) $5399!!! Plus 1.99% Financing for qualified buyers until April 30. FREE FREIGHT and SET UP. They won't last long. Only dealer in PA. which exclusively sells and works on Husqvarna motorcycles for the past 20 years, no other brand comes first. Check out our Husqvarna pricing on your parts and accessories before you buy. Stop in and check out our new Husqvarna riding gear and casual clothing. Toy Tech Cycles has been in business since 1991. We have been a Husqvarna dealer since 1999 and take pride in our high level of service to our loyal customers. We keep a large supply of Husqvarna oem and aftermarket parts on hand for the 1998 - 2019 models. We order and ship parts daily. 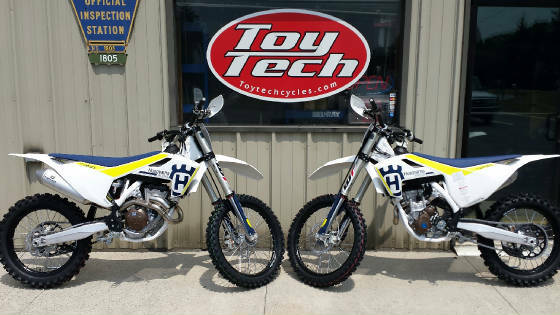 Toy Tech Cycles specializes in Husqvarna, but we do work on all makes and models of off road motorcycles, including engine and suspenion rebuilds, plus minor repairs on street bikes and atv's. We are the largest Troy Lee Designs stocking dealer east of the Mississippi, We have over 250 TLD Moto helmets in stock plus MX clothing and TLD casual at all times including a few full carbon down hill mountain bike helmets. Bell SX1, MX9 Mips, Moto 9 Mips & Moto 9 Flex helmets in stock, including Limited Edition Flex models. We are not a drop ship dealer, you can actually come to us and try the helmets on. Klotz Race Fuel Dealer. 100 unleaded & Oxy, 108 & 113 in Stock.